Everybody visits the Forbidden City, of course, but a stroll around the adjoining lakes, which used to be part of the emperors' vast pleasure gardens is a wonderful complement. Don't pass up renting a rowboat and taking a float around Beihai (or North Lake) Park, while contemplating the huge white Buddhist stupa built in 1271 by Kublai Khan. 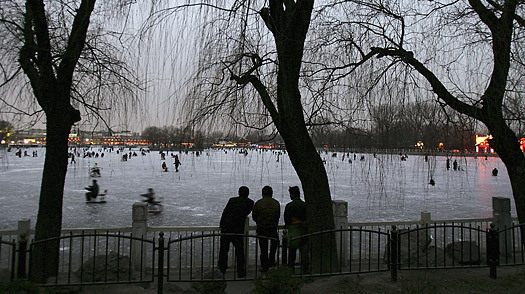 The three lakes  Qianhai (Front Lake), Houhai (Rear Lake) and Xihai (West Lake)  north of Beihai and about a mile north of the Forbidden City are known collectively as Shichahai and are ringed by restaurants and bars. Try the wildly popular cuisine of the Hakka minority group at Han Cang on the Shichahai East Bank.